Has the Greek national team’s success in Euro 2004 been a lost opportunity for a total re-structure of Greek football? For someone who is acquainted with the Greek football scene, the answer would probably be ‘yes’. The fact is that, over the last few years, Greek professional football has experienced numerous changes, manifested in elements such as institutional and club ownership structures, immense sponsorship deals, stadium developments, and enormous TV rights contracts. Despite these changes, however, the organisational aspect of Greek football – as well as the business-side – has attracted limited academic focus, and studies that examine explicitly the organisation of Greek professional football have not penetrated the scholarly debate on football. Against this background, and drawing on a recently published book* co-authored with Takis Alexopoulos (University of Peloponnese, Greece), Christos Anagnostopoulos looks at the development of Greek football with particular focus on its organisational structure. Firstly, a brief historical overview of Greek football is given, before its professional status is discussed. The core discourse concerns the institutional structure, power struggles amongst the football authorities, and the financial regulations which underpin the leagues. References are made to both sporting success and geographical concentration and to the recent collaborative agreement over TV broadcasting rights. The presentation then sketches out four characteristic types of ownership seen in the current Greek professional football context, and briefly concludes with some possible suggestions for tackling the organisational challenges which confront Greek football. * This is the first textbook in Greek literature that deals explicitly with the organisation and business practice of Greek football. 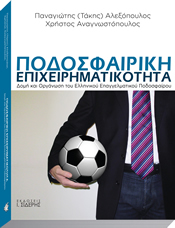 It is the principal text utilised by Dr Alexopoulos for the module ‘Organisational Theory & Football” in the Department of Sport Management at the University of Peloponnese in Greece. Alexopoulos, (Takis) P. & Anagnostopoulos, C. (2010). Business in Football: The Structure & Organisation of Greek Professional Football. [Ποδοσφαιρική Επιχειρηματικότητα: Δομή & Οργάνωση του Ελληνικού Επαγγελματικού Ποδοσφαίρου] – Athens, Greece: Sideris. Anagnostopoulos, C. “The Organisation of Football in Greece”, in H. Gammelsæter & B. Senaux (eds.) Football Across Europe: An Institutional Perspective. London: Routledge (forthcoming). Anagnostopoulos, C. (2008). A Concise Financial Overview of the Greek Football League. Oikonomia & Athlitismos, Vol. 4, No 4. Christos Anagnostopoulos is currently working as a researcher at the Research Centre for Organisational Behaviour & Leadership, Salford Business School, Salford University. He holds a PhD Graduate Teaching Assistantship position based on his research proposal entitled ‘Corporate Social Responsibility and Professional Football’. He also teaches both undergraduate and postgraduate level business-related modules including Strategic Management and Corporate Social Responsibility. He received a BA in Sport Management from Birmingham University and an MRes. in Sport Management & Business of Football at Birkbeck College, University of London. Christos started his professional career as a football player in Greece (2nd & 3rd Division) and his most recent employment was at University College Birmingham as a Sports Facilities Manager. Christos is an academic member of the Athens Institute of Education and Research, and he contributes to the Quarterly Greek Review “Oikonomia & Athlitismos” of the Pan-Hellenic Association of Sports Economists & Managers (PSAOS). His key research interests are in corporate social responsibility and in the utilisation of grounded theory methodology.